Your donations have provided breast health services to 656,649 New Yorkers throughout a nine county service area. That includes over 12 million people, which is 62% of the population of New York state. Mammograms are absolutely critical in detecting new cancer growth early and keeping the chances for survival at their highest. Over 64,000 mammograms have been provided in the last five years. Clinical breast exams are one of the first steps toward discovery of breast cancer. Over 72,000 clinical breast exams have been provided in the last five years. The fight with breast cancer is never easy and often necessitates support in numerous facets of every day life. Over 181,000 supporting services including meals, legal services, transportation, diagnostic services, psychosocial support, as well as mammogram and diagnostic service referrals have been provided in the last five years. Breast cancer statistics don't improve without increasing awareness and educating the public about what they need to do to increase their chances for survival. Over 178,000 New Yorkers have benefited from education opportunities in the last five years. 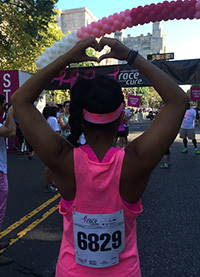 Through your donations nearly 3,500 breast cancers were detected in that last five years!